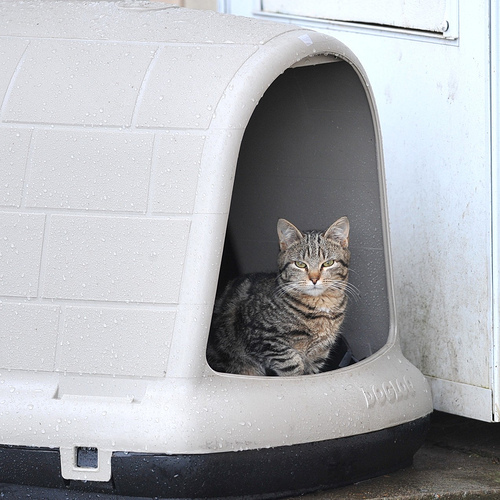 semi-feral cats in Woodland, Wash.
WOODLAND, Wash.–We can’t always count on non-profit animal organizations to do everything. Here’s the story of how one dedicated cat-loving woman in Washington is making a difference for semi-feral cats. 2011 update on Flickr. This woman is amazing. Newest Update – Cats seemed hungry. NEWER UPDATE with photo + comments. Last of 20 cats have been trapped, spayed & neutered. An amazing story how one woman really made a difference. UPDATE with photos and comments. 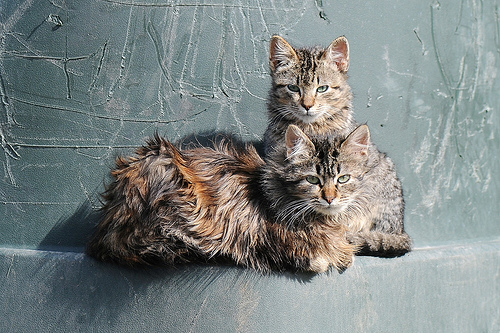 What are semi-feral cats? Cats that are used to being around humans as they live in a parking lot, but are too wild to touch/ handle/catch. A person would be shredded if they tried. She would like to intervene and provide trapping, spaying/neutering and releasing and then to ensure the cats are fed. The owner of the housing development would not sign a release so the feral cat organization could not go on the property to help. Did she give up? NO! Rebecca made friends with the residents. Ingeniously, she handed out a letter written in Spanish explaining who she was and that she wanted to help the cats. Since then she has been making a 60 mile round trip to trap one cat at a time and then she takes them to her vet. She brought the cats a dog igloo to keep them warm, feeds them and traps them. She now has two live traps and was happy to catch three cats recently. Rebecca has been picking up the tab. Now a few of her Flickr friends have sent money to help. My friend Diana considers Rebecca a hero and so do I. This task has to be so difficult to accomplish alone but she is passionate and dedicated. Let’s say it’s part of her DNA to find lost and neglected animals, get them medical care, and then find them homes. Then consider helping her cause by passing along this story or sending a small donation. Rebecca is a magnificant kind woman. Generous, she has a natural affinity with nature. Her photography is superb. She connects with animals, wildlife and all forms of nature. Her heart is huge, extremely compassionate. I have never personally met Rebecca, but I understand her plight. She makes a difference. If every one of her contacts donated $5 to $10.00 towards the cause, it would make a huge difference. Words of encouragement are of course wonderful -however, she is doing the hard work – stepping up to the plate and sending her a donation now and then really makes a difference. Bless you Rebecca – your kindness will return in many forms.